This manatee is named "Buoyance," for the injury to her lung that makes her float to the top of the water. 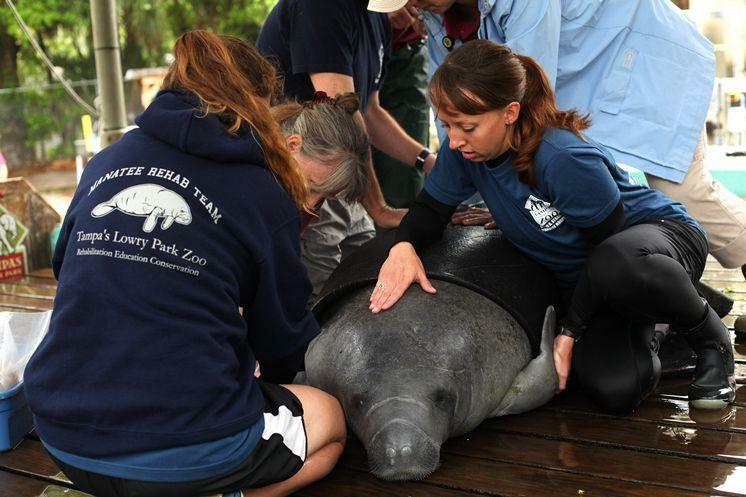 The Florida Manatee and Aquatic Center habitat at Lowry Park Zoo in Tampa has cared for more than 300 sick and injured manatees. This week on Florida Matters, we discuss the request to downlist the manatee with Patrick Rose, the executive director of the Save the Manatee Club; attorney Christina Martin with the Pacific Legal Foundation, which filed the request to move the manatee from endangered to threatened; and Craig Pittman, a reporter for the Tampa Bay Times and author of "Manatee Insanity: Inside the War Over Florida’s Most Famous Endangered Species." The U.S. Fish and Wildlife Service is reviewing the endangered status of manatees. Tonight on Florida Matters on WUSF 89.7 FM at 6:30 p.m., a panel of experts discusses the petition from the Pacific Legal Foundation to take the manatee off the endangered species list. The Florida Manatee and Aquatic Center habitat at Lowry Park Zoo in Tampa has cared for more than 300 sick and injured manatees, including one they have named "Buoyance," for the injury to her lung that makes her float to the top of the water. Virginia Edmonds, who has been working at the manatee hospital for about 18 years, explained how they are treating "Buoyance," who has been at the zoo for about a month. Endangered species are ones that are in danger of extinction now, while threatened species are ones that likely will be on the verge of extinction in the future. Manatees have been on the federal endangered species list since it was first published in 1967. Officials say a status change will not mean a change in federal protections for the animal. Biologists have pointed to Red Tide algae bloom as the reason for so many manatee deaths in Southwest Florida, but now, they’re trying figure out what’s killing so many manatees on the east coast of Florida, the Tampa Bay Times reports. They suspect algae is playing a role, since it has killed off much of the sea grass the manatees eat. Scientists are worried about the the rate at which bottlenose dolphins are washing up on Florida beaches, victims of mass die-offs that appear unrelated. What Is Killing Dolphins in Lagoon? Researchers are alarmed by a massive uptick in death rates of dolphins, manatees and pelicans in the Indian River Lagoon on Florida’s east coast, the Tampa Bay Times reports. The ecosystem is one of the most diverse in the world, and scientists can’t say for sure what’s killing such a wide array of animals.